1. Reclaiming my personal Identity and moving from being out of control to being in control of my emotions and behaviour. 3. Moving from emotionally shut down to experiencing emotions (Emotion chart and work sheet). 4. Building up and establishing ordinary life coping skills which inter alia include taking on and making decisions and becoming independent taking full responsibility for own behaviour and actions! Establishing clear boundaries. Moving from an incomplete and disconnected self awareness to a connected whole self image. Inner peace, self love and approval from within Setting reasonable goals. Recognizing my dysfunctional ego states and managing them by applying BWRT REBT, DBT and CBT tool boxes. The patient’s needs and goals to be evaluated upon admission and support to be offered at all times to the partner, parents and family members of the patient. This is of vital importance to me as a therapist. The patients needs, expectations and goals to be clearly indicated and discussed at the first ward meeting. 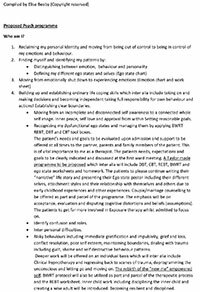 A Taylor made programme to be proposed which inter alia will include DBT, CBT, REBT, BWRT and ego state worksheets and homework. 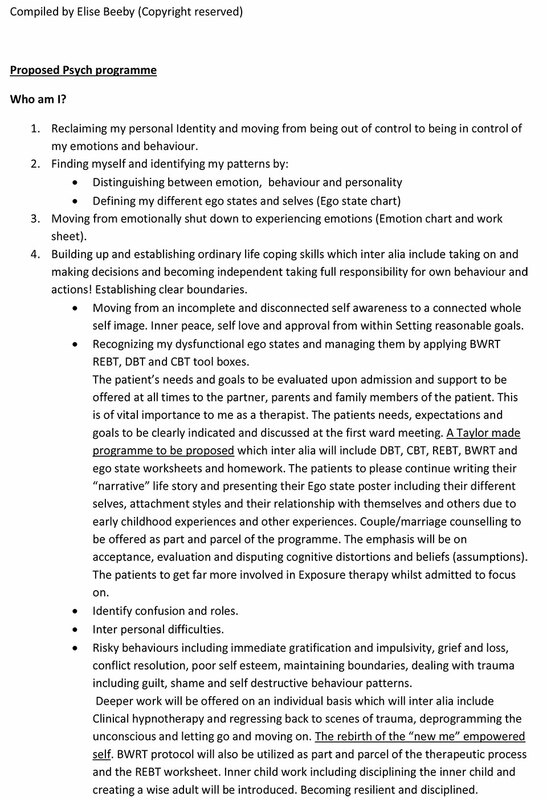 The patients to please continue writing their “narrative” life story and presenting their Ego state poster including their different selves, attachment styles and their relationship with themselves and others due to early childhood experiences and other experiences. Couple/marriage counselling to be offered as part and parcel of the programme. The emphasis will be on acceptance, evaluation and disputing cognitive distortions and beliefs (assumptions). The patients to get far more involved in Exposure therapy whilst admitted to focus on. Risky behaviours including immediate gratification and impulsivity, grief and loss, conflict resolution, poor self esteem, maintaining boundaries, dealing with trauma including guilt, shame and self destructive behaviour patterns. Deeper work will be offered on an individual basis which will inter alia include Clinical hypnotherapy and regressing back to scenes of trauma, deprogramming the unconscious and letting go and moving on. The rebirth of the “new me” empowered self. BWRT protocol will also be utilized as part and parcel of the therapeutic process and the REBT worksheet. Inner child work including disciplining the inner child and creating a wise adult will be introduced. Becoming resilient and disciplined.